When firing up the Big Green Egg is too much of a hassle, my husband and I go to Stack for our barbequed meat fix. With a huge smoker displayed in a glassed-in room, Stack is the real deal; they’re not preparing “barbeque” in a regular oven or salamander. Thanks to the equally powerful exhaust system, even with the centrally located smoker, the dining room only has a hint of smoldering wood and smoked meats aroma. As expected, their pulled pork ($12) arrives with plenty of barque mixed into the mountain of meat. 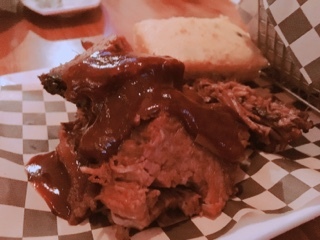 With three versions to choose from, the North Carolina version was my husband’s first choice – the vinegar based sauce has a pucker inducing quality that also helps mellow out the fattiness of pork. Indeed, the meat was full-flavoured and delicious, but the dense bun made the sandwich heavy and it felt like the carbs were at odds with the protein. 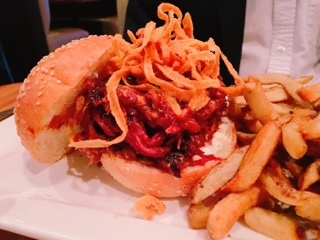 Perhaps switching to a lighter brioche would make the pulled pork even better. All sandwiches arrive without sides; the tacked on fries ($5) were an amazing combination of fresh cut potatoes, hot temperature, and crispy edges. 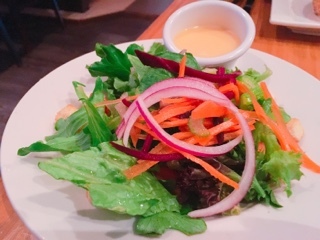 They were much better than the house salad ($5.50), where the citrus vinaigrette was sickeningly sweet. Resourcefully, I salvaged fallen pieces of pulled pork from my husband’s plate to flavour the salad in lieu of dressing. 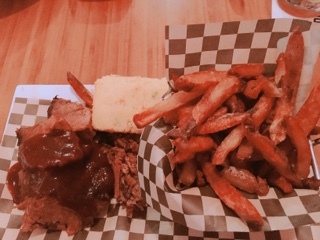 Stack’s brisket dinner ($20.49) is a popular choice. Despite being very lean, the meat is tender enough, although I’d prefer it cut thinner so it’d be less chewy. Topping the meat is a sweet barbeque sauce that’s thick enough to wipe off if it becomes too much; personally, I really liked it and wished there was more sauce. Although the plate doesn’t come with the pickles and onions noted on the menu, there was a sizeable piece of warm corn bread. With the large basket of fries (you receive a choice of side), it’s a filling meal so prepare to leave with a doggy bag. 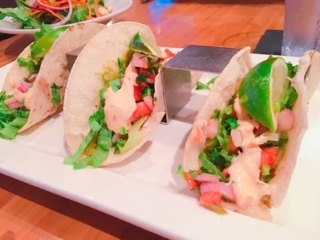 The fish tacos ($12) were surprisingly good for a barbeque restaurant. While the grilled catfish did get a little lost amongst the toppings and could benefit from the spicy sauce being placed directly on the fish (since it’s under seasoned), the thin corn tortilla was a great choice for a wrapper and each taco incorporated ample amounts of guacamole, pico de gallo, and roasted corn kernels (a great addition that really made the taco). Although I still prefer my husband’s barbeque creations, it’s difficult to dedicate the hours of preparation and cooking required to make really flavourful meat. Thankfully, Stack’s smoker is always preparing something that actually incorporates the smoky aromatic essence. During weekdays and the winter, Stack is where to go.